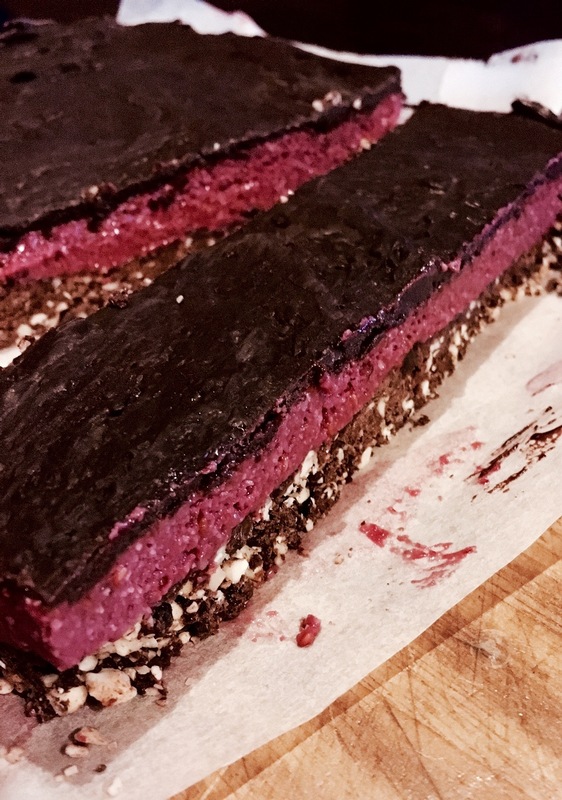 This is a raw slice with a chocolate ‘crumb’ base, dairy-free creamy raspberry centre and a glossy chocolate topping. 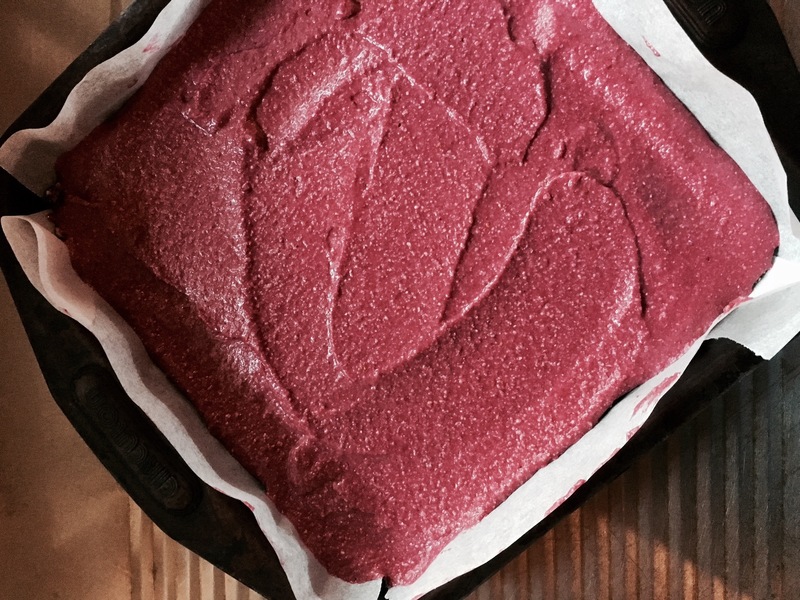 Recipe is raw, vegan, dairy-free and, most importantly, it tastes amazing. These babies are FULL of antioxidants and fight free radical damage. 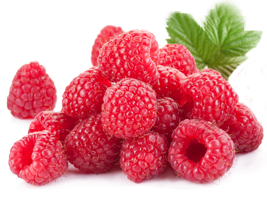 Vitamin C, Fibre, Copper, B Vitamins, Manganese and Iron give you many other nutritional reasons to indulge in raspberries. They also contain high levels of ellagic acid, a polyphenol with known anticarcinogenic properties. Research indicates this phenol may be effective as a cancer preventer and inhibitor, binding cancer-causing chemicals and rendering them inactive. Anthocyanins found in raspberries are a flavanoid compound responsible for it’s red colour and have been shown to protect the body against heart disease and dementia. They are also useful in strengthening the veins and circulatory system. Line a 20cm by 20cm baking pan with enough baking paper to hang over the sides of the pan – 2 strips, 20 cms wide, crossed over each other. You need to do this to help lift the slice out once it is ready. Like a sling. Grab the jug of your high-speed blender or food processor and chuck in the 4 base ingredients. Whiz it into a course paste. Spread evenly into the pan and press down with the back of a spoon (Wet spoon if it sticks). Pop into the freezer to let it firm up while you do the filling. Rinse out your blender jug. Chuck in the filling ingredients. Whiz this until it is a nice smooth looking paste. Pull the tray out of the freezer. Spread filing mixture carefully and evenly over the base. Stick it back in the freezer to firm up while you whip up the chocolate topping. Fill a saucepan with some water. Bring it to a simmer over a low heat. 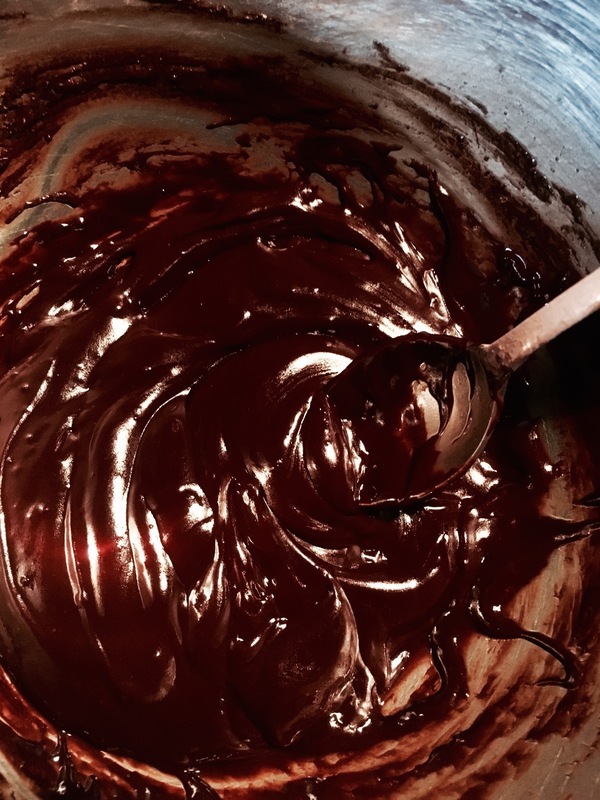 Put all the topping ingredients in a metal mixing bowl and place bowl over the saucepan – stir mixture until coconut oil melts and combines to produce glossy, smooth and spreadable chocolate. Get the slice out of freezer and evenly spread chocolate topping over the top of raspberry filling. Use a butter knife that has been dipped in warm water to get a smooth surface. Pop it back in the freezer to set. This should take an hour or two (depends how hungry you are).